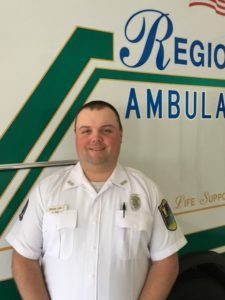 Brian is being honored as a Star of Life for his commitment to his community and to his patients. Brian was nominated by several of his peers. Brian started in EMS 15 years ago as a volunteer, and he has worked for Regional Ambulance Service for the past 11 years. Brian is a Critical Care Paramedic where he displays professionalism and provides exceptional lifesaving skills. Brian never buckles under pressure and is always calm and collected, no matter the nature of a call. Brian is extremely confident and knowledgeable when it comes to emergency medicine. Brian is the type of Paramedic you hope shows up at your doorstep if you or a family member is facing a medical emergency. Brian has also served at his local volunteer fire department for the past 19 years, and has shown his leadership capabilities serving in officer positions, including Deputy Chief.